Since my parents retired and moved to Tennessee last October, we haven't been sure how often we'd be able to visit. We got down there around last Christmas though, and while there the Missus saw a brochure for a "Railfest" which was going to take place in September, 2015. I'd never heard of this event - and had only a very passing knowledge of the Tennessee Valley Railroad Museum. Could we swing another visit to Tennessee within 9 months? Well, you know the answer. But it wasn't until the event got closer and I got more details that I realized this trip would actually be a homecoming in more ways than one. You see, while the flashpoint for my getting into model railroading and railroads in general was Christmas 1982 (another story for another time), my earliest memory of a train occurred sometime in the summer of 1973. 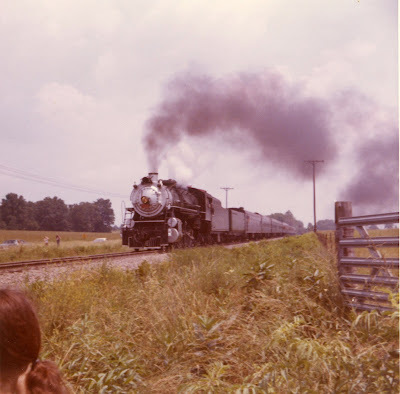 The Southern Railway's 2-8-2 Mikado #4501 was doing some mainline fantrips in Indiana that year and since we lived not too far away in Louisville, KY my parents took me to see the train. 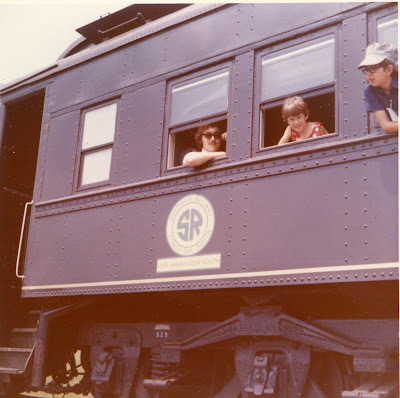 I don't know whether I have actual memories of seeing the photo runbys or if I'm just recollecting the old Instamatic snapshots of the day, but I do have a distinct memory of riding the train itself (and there are no photos of that). Well, the 4501 and I have traveled very divergent paths over the last 40+ years, but as I looked over the Railfest details in the weeks leading up to our trip down South, I discovered that we'd be meeting again. Not only would the 4501 be headlining the event(! ), but my dad would be going with me to see her again after all these years. The weather forecast all week had been for rain, so I didn't bother getting tickets ahead of time. Thankfully, as you can see from the photos, the day turned out to be gorgeous! And while there was a line to get in, it didn't take us that long. There was definitely plenty to see. Between all the exhibits, the model railroads inside the station/museum building, and the actual mainline freight traffic, we were able to spend an entire day without getting these slightest bit bored. The above is the first shot I got of the 4501 before it departed for its first of two trips of the day. The Norfolk Southern mainline is there in the background. Visiting from New England, I couldn't believe how many freight trains there were. As impressive as the locomotive was (and it was, for sure), the train itself wasn't anything to sneeze at. Here's a beautiful boattail observation car bringing up the rear, just as it's supposed to. Each time the 4501 departed, it had to nose out onto the main, then backup west past the signal and wait til the signal turned green. The above shot was taken from the tower/station as the train was backing. And she's off! Once the train got the signal, it was two blasts of the whistle and full throttle out (being careful not to slip the drivers). The display was pretty amazing, as you can see. Once the steam train left, we roamed around the display yard some more. Here are two special locomotives that NS donated for the day. This is the regular TVRM excursion train that goes through a tunnel through Missionary Ridge. After enjoying roaming around all the cool displays, 4501 returned for her 2nd and last trip of the day. It was much harder to get shots of her (more people, more - ahem - security) but persistence prevailed. We'd be leaving TN the next day, so this was a more-than-fitting end to our trip: Amazing weather, amazing trains, and a wonderful time with my dad visiting an old friend from over 40 years ago.